Zelda K. Method or Madness? Today we begin with information from a fractal analysis of Jackson Pollock’s paintings, take a look at fractals in general and specifically those of Mark Townsend, and end with Rose Rushbrooke’s quilted fractal art. This journey raises several questions. In the late 1990s, Richard P. Taylor, a physicist at the University of New South Wales in Sydney, Australia, who is also trained as an artist, thought he recognized fractal qualities in Pollock’s paintings. 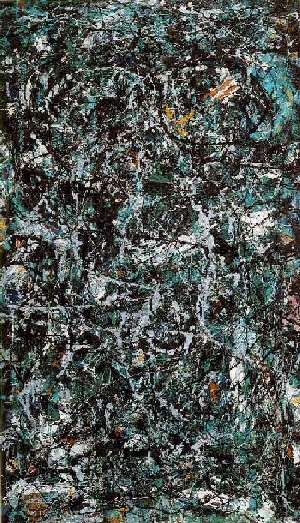 According to Ivars Peterson (http://www.maa.org/mathland/mathtrek_9_20_99.html), online editor at Science News, (http://www.sciencenews.org), Taylor first applied this theory to Pollock’s painting Blue Poles, Number 11, 1952. The painting was first photographed, and then the photos were scanned. 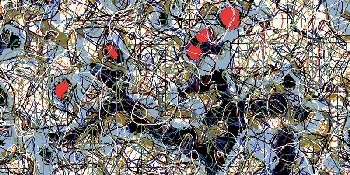 Computer analysis of the color schemes and trajectories indicated Pollock’s patterns can be described as fractal. The resulting paper positing this process as a potential method for authentication purposes can be read at http://materialscience.uoregon.edu/taylor/art/TaylorSubmission.pdf. In 2002, a cache of paintings was found in the belongings of one Alex Matter’s deceased parents. There was reason to think these might have been done by Jackson Pollock, and efforts were made to determine the authenticity of the paintings. Taylor was asked to give scientific input by applying his fractal analysis process. None of the found paintings exhibited the fractal characteristics of several of Jackson’s known paintings. Here are some images for comparison. Several other images of his paintings can be found at http://www.artchive.com/artchive/P/pollock.html#images if you would like to view more than the two I’ve uploaded here. and Caricature, which are reminiscent of some of Pollock’s paintings. 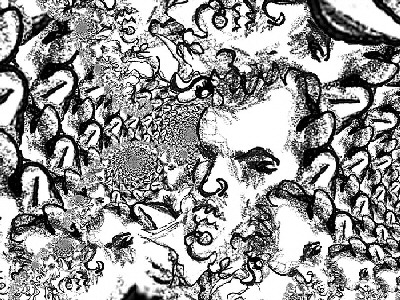 http://www.fractalus.com/fdimentia/recent/index.html Mark has several fractal images that are reminiscent of Pollock’s paintings. The third is the sample of Jones-Smith’s scribbles given in the Science News Online article mentioned above. I’m not qualified to comment on the fractal nature of Pollock’s or Smith-Jones’ work, (Townsend’s ARE fractal images), but, personally speaking, I do not find her squiggles to have anything near the same essence as the constantly wandering lines in both Pollock’s and Townsend’s work, or of any other fractal artist’s work with which I am acquainted. Now let’s take a look at the question “what is a fractal?” It might seem I should have placed this earlier in the narrative, but for those who might not be familiar with fractals it would be better to compare Pollock’s pre-fractal paintings with some modern fractal images rendered in a style similar to Pollock’s, before discussing fractal structure. The definition of fractals given by Jones-Smith and Mathur is very limited and rigid if not downright Euclidean, but fractal geometry, while mathematical, is much more fluid and difficult to pin down, non-Euclidian, generating ongoing debate among mathematicians and scientists about just what constitutes “fractal”. A better (in my opinion) definition of fractals is this one found at http://www.fractalus.com/fractal-art-faq/faq03.html. And on this page http://www.fractalus.com/info/layman.htm is a description of fractals intended for anyone who has the urge to run from the room when math is mentioned. If you are unfamiliar with fractals, http://www.fractalus.com hosts galleries for several very talented fractal artists, and has links to many informative sites. It’s worth the time to browse the site. Another excellent fractal art site is http://www.parkenet.org/jp/. In the mid-1970s, Benoit Mandelbrot coined the term “fractal”, but the beginnings of fractal geometry occurred early in the 20th century when Swedish mathematician Helge von Koch developed the Koch Curve, a line segment that repeats infinitely. The first image shows the Koch curve with four orders of magnitude. The line at the top with only one triangle jutting up is the first magnitude, the bottom one with the points so small they are beginning to become indistinct is the fourth order of magnitude. The second image shows the “snowflake” that results from joining three lines. This webpage has a very good and understandable explanation of the fractal nature of the Koch curve to accompany the above illustrations, along with an animated zoom that shows the infinite repetition in continual progression. Exploring fractal structures is next to impossible without the aid of computers to rapidly perform the necessary calculations. The addition of coloring algorithms in fractal generating applications increases the already vast possibilities of form available in fractal geometry, and gradients put color in the form. The computer age and advanced mathematics have given us fractal art, mathematics made visible. There is something about fractal structure that seems pleasing to the human eye. The mandlebrot set is widely recognized as a classic fractal form. Exploration of the mandelbrot set is the basis of much fractal art, but keep in mind that this is a vast oversimplification of things. What does one do with a fractal after creating it? Fractal galleries abound in cyberspace. Fractal prints are available as posters and greeting cards, fractal images are printed onto t-shirts and other garments, used as illustrations for book and cd covers, and show up just about everywhere. Janet Parke sells fine art prints. Some of Kerry Mitchell’s fractals have been used to make textile prints. The list goes on and on. Rose Rushbrooke creates original fractal images on her computer, and then translates her digital art into art quilts. 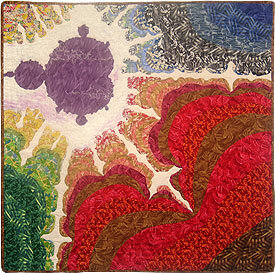 Her work has been on display in many venues, and can be seen at http://www.roserushbrooke.com/fractal-art-quilts-1.html. Rushbrooke is an accomplished artist in addition to her fractal art quilts, which can easily be seen by perusing her website (http://www.roserushbrooke.com), but it is her fractal art quilts that I want to examine in the context of today’s post. Both are easily identifiable as explorations of the basic mandelbrot formula. The fractal nature of the artwork is accepted by the observer, without complex mathematical analysis or quibbling over what constitutes a fractal. Given that Pollock lived a troubled and turbulent life, is it possible that he was illustrating his feelings at the same time he was expressing them, that the expression IS the illustration? What about abstract expressionism in general? If you think the expression is the illustration, does it also work in reverse – is representational art also an expression of feelings at the same time it illustrates? Are illustration and expression mutually exclusive or are there some gray areas? Would you agree that some of Pollock’s paintings contain fractal elements? If his drip and pour methods do exhibit fractal elements, might this be an unconscious expression of the fractal elements of nature? How do you see Pollock’s paintings as an expression of the man himself? Do you see your own artwork as an expression of yourself, your feelings, as illustrations, or as some combination of the two? Do you think fractal art reveals the artist? Might this debate call into question the fractal element in Rushbrooke’s fractal art quilts? Her work exhibits very few orders of magnitude, and yet most would agree it has fractal content. If Pollock’s work was analyzed with complex mathematics to determine fractal content, how would Rushbrooke’s quilts be analyzed? Other fractal art? It seems all artists, even painters, must at some point justify themselves for existing as artists. 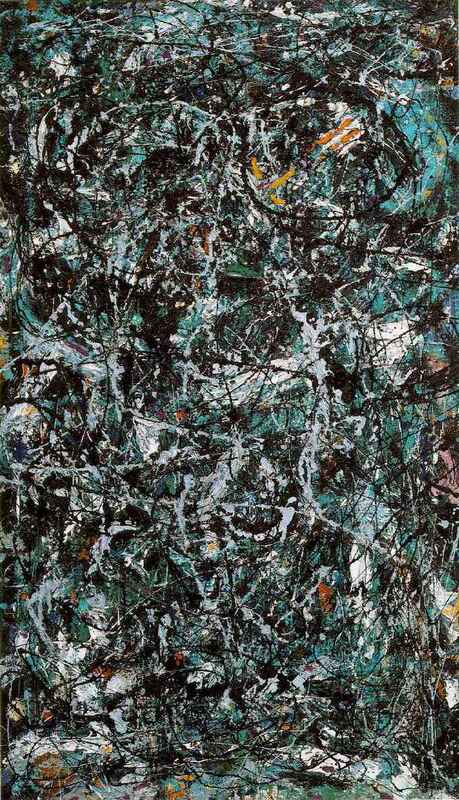 Methods are often criticized, as was the case with Pollock. Each new technique, material and tool must fight an uphill battle to become accepted. Acrylic paints were at first somehow seen by some as a form of cheating because the artist no longer had to grind and mix her or his own pigments. Photography was not accepted as an art form for a long time. Art quilts and other forms of fiber art are still not always accepted as art. And we’ve entered the computer age, which allows the production of pleasing forms from mathematical formulae. Fractal artists often hear the comment that “the computer did it.” But it still takes an artist’s eye to make good fractal art (and there is a lot of it out there that isn’t good), and one must learn how to mix light rays instead of paint using red, green, and blue instead of red, yellow, and blue. They must use principles of good composition and use computer applications instead of paintbrushes. Fiber artists have heard criticisms of materials and tools meant to keep their art from being recognized as such. How do you react to Pollock’s quotes above? How do you respond if someone says you are not making art because you use fabric, thread, etc? What do you think of the addition of computer as artist’s tool? Are there limits to what can be used as art materials or tools? Do methods, materials, and/or tools define what is art? Delights listed here. I’m incredibly happy to appear your posting. Thanks for awaiting feel you actually. Are you going to make sure you decrease me a send? Hi it’s me, I am also visiting this web site regularly, this site is genuinely fastidious and the people are truly sharing good thoughts. Thank you for this insight into your prejudice against fractal art. Interesting your praise of photography when it endured many of the same criticisms in its early days as an art form as does fractal art now. Photography as an art form? Absolutely marvellous work being done by people who understand what they are doing with their medium – that is, they have requisite technical knowledge to handle whatever equipment they are using, plus that special ability to go beyond mere documentation in capturing a moment in time or space which is the eye and hand of the artist at work. And so there is an analogy with the art quilt world today. Well, nothing grabs everyone. And, personally speaking, I’m quite glad it doesn’t, or there would be no wealth of diversity and interpretation. There probably would be no such thing as art at all. In only a very few instances does the form remain exactly the same when zooming in or out. Fractal geometry is the geometry of nature, of shorelines, of weather patterns, of storms, of tree branches, of chaos theory…..So the answer to your question about the mathematical relationship between the parts and between the parts and the whole remaining the same is “not at all!” Self-similar is the operative term, and the farther one zooms, the more changes there are. Fractal geometry is dynamic, not static, despite the definitions. So there is lots of room for the artist to be present in the work. All art forms have some limitations within which the artist must work, whether tools and materials, or technique. And, of course there are the limitations of each individual mind and vision. Some are able to maximize expression within those limitations, and some never progress beyond the minimum. I think most range somewhere in the middle. How do you feel about photography as an art form? Adlez posed a couple of Q’s – no I didn’t care for Rose Rushbrooke’s fractal art quilts, and nothing I saw on her website particularly grabbed me. What I meant by the ‘cold and calculating’ term I used: from my understanding of fractals you can keep going down down down onto microscopic scale or move up , up to some gigantically awesome scale and the pattern itself still remains the same in terms of mathematic relationships between each part and between every part and the whole, right? If so, then my response is “So what?” To me this is something of science not art, something that is so clearly defined by methematical relationship, imho leaves no room for the interpretive eye, the mind, the creative hand, of the artist, no matter how much we love patterns containing as they do the implocation of precise duplication. Love of pattterns explains the popularity of traditional geometric quilts, mosaic tile patterns thorughout the middle east, geoemetric and swirly repeat patterns on ceramics, wood carvings and furniture, using various tools, from every age and geographic space, to say nothing of woven and printed textiles produced everywhere in some measure. To me, pattern just on its own is decoration, bearing much the same degreee of relation to “art” as does craftmanship. Interesting further comments re Pollock’s work – I hadn’t thought how it could in effect fractalise due to his body rhythms in creating his art (or should that be performing his art? vbg) and perhaps that is the key to why I don’t strongly relate to fractals – by their nature there is nothing that suggests the active role of the artist in there. Thank you for this comment. I love that you also could picture Pollock “channeling fractals”, which is pretty much what struck me when I first read the Science News article. And it is that surface chaos with underlying structure that appeals to me, too. I can’t say I thoroughly understand fractals, either. But my introduction to fractals brought the greatest math understanding I’ve ever had. It was almost scary when I realized geometry isn’t math; geometry is spatial relationships and math is the language which describes them. And to understand numeric systems based on something other than 10. But the best thing is that good fractal software means you don’t have to be a mathematician to investigate fractal art!! It took me this long to reply to your very interesting post because I had to read it several times, and to look at the sites you directed us toward. Recently I had an unusually heated discussion with two old friends of mine (not artists) who said they hate Jackson Pollock’s work and were astounded when I said I love his paintings. When they asked why, I thought for a moment and said, “Because I love to look at them! Because I think they look chaotic on the surface and yet feel so harmonious and balanced. Because they seem chaotic and yet reveal an essential pattern under the surface.” Then I read your post the next day. It seemed the universe was speaking to me again. . . .Don’t you love those synchronistic happenings? Wow! Pollock using his arms, his body to “channel” fractals? Why not? I can’t say I really understand fractals; but I have a basic grasp of them I didn’t have before reading your post and looking at the fractal sources. Thank you so much. I urge those readidng this to look at the articles Zelda oints us toward. The fractal art winners of the Mandelbrot contest are phenomenal. Gives new meaning to computer-aided art in my opinion. And thanks, too, June. This new blog set up makes it so much easier to go back and reread things, and reread people’s responses. Thank you for this comment. Everything you said, you said very well. I’ve been thinking a bit on “producing” versus “being”. I think you covered that pretty well, too, in looking at the differences in Pollocks’s materials and methods as opposed to art quilters’ processes. But I think it’s also probably true of 99% of art output. Does the artist control the process, or does the process take over and drag the artist along? I’m going to have to think about this one for a while. This has been a great experience for me, and what little discussion has ensued already has my mind racing along at least six different possible future topics. I never quite get the math/science of fractals, although the notion of “self-similarity at different scales” and “variations on a theme rather than exact repeats” seem infinitely useful – the kinds of ideas that can be muckled around to fit a lot of different situations. I am also boggled by the notion that one can make mathematical formulas generated by computers and translate them into colorful shapes and forms. On the one hand, the idea of fractals makes complete sense (self-similarity at different scales) and on the other, they are completely mysterious to my non-math brain. But then there’s the further twist, the shapes and colors that get turned into art. I rather suspect making art from fractals is a bit like making abstract work — that it’s a lot harder to go beyond the beginning stages to something artistic than those on the outside would imagine. And the process using the computer, it seems to me, is far less a product of “being” than of “producing.” And it’s “being” that Pollock thinks of himself as part of. First, it seems intuitively obvious to me that Pollock could have produced images that have fractal patterns. He would have had to establish a rhythmical movement to fill the huge canvases that he’s working with. His arm swings must have fallen into patterns that he replicated over and over. I fail to see why there should be any skepticism about the possibility of a highly fractilated (is that a word? — I mean “order of magnitude”) Pollock painting. It’s sort of a tempest in a teapot. However, the possibility that Pollock integrates emotion and expression (re Zelda’s question “How do you see Pollock’s paintings as an expression of the man himself?” ) is interesting. If I’m understanding the idea correctly, it would seem that Pollock’s fractiles are a direct result of his emotions/body movements, as opposed to someone who paints a picture which she is hoping will result in or illustrate an emotion. The “illustration” is at least one further step removed from the emotion — Pollock/movement>emotion>fractilated image whereas painter>picture>evocation of emotion>emotion. So Pollock’s “Every good painter paints what he is” is very different from an idea that “every good painter has an underlying idea or emotion that she wishes to convey.” The difference between “is” — a state of being — and “will” — a state of hopeful future event. This difference could be seen in the very different ways the art is approached by the artists — Pollock’s whole being makes the paintings; quilt art is designed and colored and stitched under carefully controlled mechanical conditions. We can’t throw ourselves into our work in the same physical way that Pollock could. I think that art quilts are an amalgam of heavy duty execution — sheer stubborn work at the machine tied to a lot of underlying comprehension of the material — and a tiny bit of self-expression. There’s probably a continuum across which quilted art fits — from highly controlled to highly expressive — but the obstacles placed in the expressive area are real and strong. If you don’t know how to operate a sewing machine (not a skill automatically learned like handling a paint brush) you must first learn that. You must learn about how to keep beads on the surface; you must figure out bindings, etc. I suspect that one reason quilted art doesn’t make many artistic breakthroughs is that the need to learn technique becomes a self-fulfilling activity. That art quilters tend to see technique as the “art” because it’s the predominate attribute of making an arty quilt — the use of new materials and glitz and the infinite up-the-ante “standards.” What Pollock did was say that he and his art were one — that the way his body moved made his art; it wasn’t just a technique to be learned but it was him. Most of us would have trouble really saying that — there are weeks when we are executing our already settled artistic designs, when we are using hand skills to finish edges, when we are making rod pockets. I chose the two examples from Rose’s work for their simplicity, since I felt I was throwing a lot of information into one post, and wanted to stick to the basics. I certainly never intended to imply that tweaking a fractal is the same as choosing your own colors and fabric prints to make a traditional quilt block pattern. For one thing, most traditional quilt blocks are Euclidean geometry, and fractal geometry is not. One is all straight lines and angles, the other is curves, invisible points, recursions, etc. Eileen explained it quite well with her analogies of taking a photograph, them making an art quilt from the subject of the photograph, or looking at a tree for inspiration. I also don’t think fractals are any more cold and calculating than a painter first making a sketch from which to work before applying paint to canvas. My original post arose because I was intrigued by the idea of fractal analysis being used to possibly authenticate Pollock’s paintings, and felt the basic fractal information and inclusion of Rose’s work to be of use in looking at that premise. Also having the almost diametrically opposed work of Rose and Pollock to examine the orders of magnitude issue because Rose’s quilts would not be questioned as fractal art, while the critics of Taylor’s analysis cited the small range of orders of magnitude as one of it’s weaknesses. Mark’s fractals were tossed into the mix because they are computer generated fractal images that do show similarities to some of Pollock’s work. Of course, Mark is also an admirer of Pollock. So, for anyone with further interest in whether or not making a fractal is easy because the computer does it can download a free 30-day trial of Ultrafractal at http://www.ultrafractal.com. UF has the most user-friendly interface of any of the fractal software with which I’m acquainted. UF deals with escape time fractals, Xenodream with IFS fractal structure (but does not yet have a free trial download), and Mark Townsend’s Apophysis generates flame fractals. Apophysis is also available as a free download for anyone who wants a look. I first investigated fractal software in 1998 for inspiration in my design work, but became seduced by the fractals themselves. Unlike Rose, who combines two mediums quite well, I continue to work separately in each, although there is mutual influence sometimes between the two. But in my original post I was really more interested in the questions that were raised along the way as I read the original Science News Online Article than I was in expounding fractal art. Well, I guess you just have to watch someone using the fractal software and choosing a part of the image, tweaking the way it is displayed, zooming in and out, making colors which are high contrast to bring out lots of the pattern or low-contrast to hide parts… It’s not a straight-forward, non-interactive process. 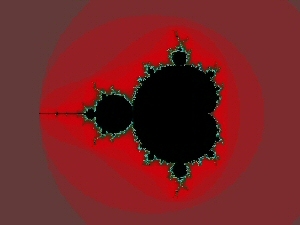 The two examples of Rose’s work both use that Mandelbrot set, but others use entirely different patterns. Isn’t it cool when science and art overlap? I don’t use my sewing machine to help me design my work – I use it to sew the pieces of fabric together. The design doesn’t come from the machine nor does the machine have input into the design – it is simply a tool to create the design I have in my head. From what I understand the computer does create the design Rose is using. Sure she has to provide a few parameters but the basic structure of the lines and shapes of the resulting image were not created by the artist but by the computer. I almost see it as the computer creating a pattern to be used in creating the quilt. Sure she can help in the pattern creation by tweaking it here and there but the basic mathematical model provides the structure – it isn’t coming from the artists imagination (or interpretation of some real structure). Is this very different from taking a traditional quilt pattern and interpreting it with your own colors and fabrics? In this case the artist has a few parameters to set – which pattern – how big – which colors. But the basic structure is a given. 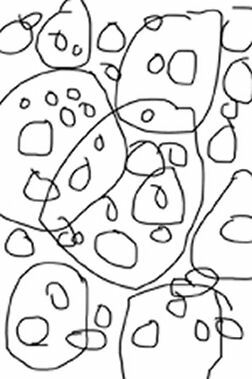 I’m not saying these are bad things – but I do have a problem with saying using someone else’s pattern (be it from a computer or elsewhere) is the same as all other non-representational artwork. I may be biased, since Rose Rushbrooke is a good friend of mine… She calls herself a “fractalist”. Through many conversations I’ve learned about the thought and skill she puts into her work. The computer is a tool for creating her fractals, just as we use our sewing machines and photographers use cameras and all kinds of technology. 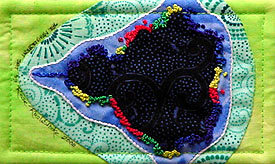 Even though Rose uses a computer, she still has to choose the compositional area (since the fractal is infinitely large) and colors, and then fabrics, and often hand appliques and embellishes the artwork. It is not so different from other kinds of non-representational art. If you didn’t know it was made with the assistance of a computer program, would you feel differently about this art genre? I don’t see them as “cold and calculating” but as expressions of composition and color – and especially, pattern and repetition. First, I’m envious that you actually saw Blue Poles up close and in person, as the saying goes! Too bad about bits and pieces falling off, but that leads my thinking back to another topic idea I had and maybe a different way to approach it. I wasn’t familiar with Michael James, did a search, and came up with a musician, a photographer, and an art quilt maker, among others. Making an informed guess, I looked at the art quilts and would have to say they tend to leave me a bit unmoved also. I’m curious about your reaction to Rushbrookes’fractal art quilts. And her work in general, because if the fractal art quilts don’t “speak” to you, it might be that her entire style doesn’t. Do you find the fractal art quilts to also be cold and calculating? Do you think the translation from the digital form into the fiber form changes some of that? I’ve never been particularly drawn to traditional geometric quilt patterns for instance, but have been quite moved by some geometric tile work, and I’ve never been able to figure out why this difference in my reactions to the two. For myself, with any art form usually some of it reaches out and grabs me and some of it doesn’t. I always thought that was true of everyone, but maybe not? I have never related strongly to the cleverness of fractal art, it always seems cold and calculating to me. A few years ago I did see the famous Blue Poles at the national gallery in Canberra Aus. Recalling the fuss at the time of its purchase I think it was 1972, was the astronomic Aud $1.5m paid by the Aus government, and how the whole population divided between loving it and hating it, I felt indifferent until I actually saw it, and really enjoyed looking, being with it, for quite a long time. It didn’t strike me then as being ‘fractal’ and I am glad my enjoyment wasn’t polluted by that notion. From the quotes and what I know about his life I think it is unlikely that Jackson Pollock had anything but pure passion, tinged with a bit of insanity, on his mind while creating his works – that is, I am sure he was pouring out passions along with the paint, and that his methodology suited his way of thinking and personal needs for expression. I like the quote that he felt it didn’t matter what techniques were used as long as something was said with the paint. I think the same can be said of fibre art, raw materials and techniques. Just because some people may not have associated them with “art” doesn’t mean they are not – and then again all the fanciest techniques, the latest processes and the computer somehow aiding it all, does not ensure the outcome will be “art” Some part of the artist, hand, mind, eye, etc – still needs to be there to differentiate Decoration from Art. You can tell I would also see the computer as a tool, often used for maximum Gee WhizzFactorRating but not necessarily generating anything more artistic… but, in the right hands, ie an artist who is skilled with the tool, some wonderful stuff happens. I found it interesting to read somewhere that Michael James had not sold any of his recent works – for several years …. in which of course the GWFR is very high as he has access to the most sophisiticated fabric printing technology…. Much of his recent work leaves me feeling he has missed the mark. His feelings/memeories may be genuine but they have not been expressed in such a way as to stop me in my tracks. I know, that sounds like heresy, but I am sure Michael is a big boy, and know he won’t be bothered should he read what I have said. I haven’t heard how it has been resolved, but I did hear several years back that Blue Poles was laid flat on its back down in the hermetically controlled basement of the gallery while the conservators researched the best way to deal with little bits and pieces falling off it ….